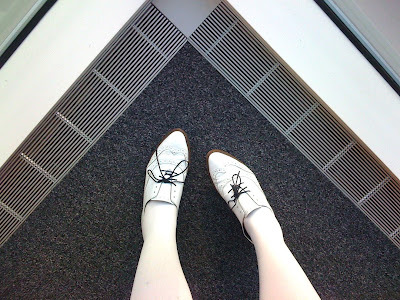 white tights, white shoes, why not. why don't i wear these more??? nothing better than free brogues. :O... that is my "O" face... that's right. VERY comme'ish. You need white ruffle ankle socks to complete!! wahhh LOVE those shoes, definitely wear them more! I like it! I'll wear a black suit with a black shirt and tie and it works. You should never stop experimenting. so good. wear them more!